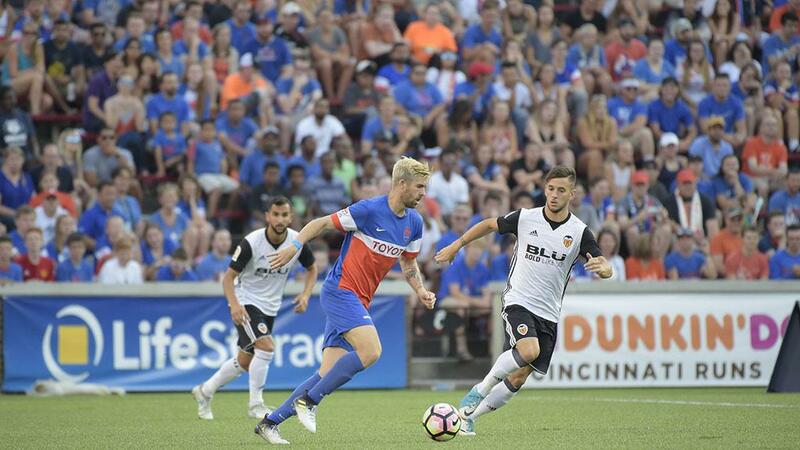 CINCINNATI – FC Cincinnati welcomed a vocal crowd of 23,114 for its second international exhibition in club history to Nippert Stadium on Monday night as La Liga’s Valencia C.F. took a 2-0 victory through Nando’s second-half tally. The night, however, belonged at least partially to FCC's Omar Cummings, who took his final professional bow at the venue where he had competed for the University of Cincinnati before an outstanding career for club and country. Valencia almost took the lead in the 10th minute as a corner kick to the top of the six-yard area from the right fell loose in the box, but the close-range finish deflected wide of the right post. FCC proceeded to go close moments later when Aodhan Quinn fired a looping half-volley from distance toward the top-left corner, only for Valencia goalkeeper Neto Murara to tip the effort over. Cincinnati continued to push forward in the opening 25 minutes, but the game began to even out as the first half went on. 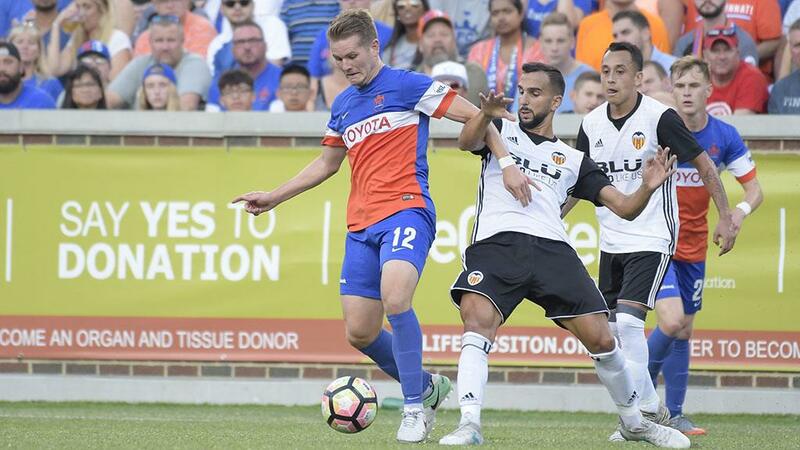 Nine minutes before halftime FCC defender Garret Halfhill made a crucial intervention to deflect behind a shot by Valencia’s Zaza, while Cincinnati goalkeeper Dallas Jaye saved well from Alvaro Negredo to keep the game scoreless at the break. FCC honored Cummings at halftime as the veteran forward – who will join FC Cincinnati's Front Office as he steps away from his playing career – entered the game for his last professional appearance to start the second half. Valencia pressed offensively to start the second half, and Aaron Walker had to clear off the line after Jaye and Sem de Wit collided going for a looping ball on the left side of the six-yard area that left the goal half-open for a chance in the 58th minute. Zaza then fired a first-time shot over for the visitors from 12 yards off a low cross from the left moments later. Valencia took the lead in the 62nd minute when Nando broke into the right side of the penalty area unmarked off a good ball over the top by Daniel Parejo, and he fired home into the left corner of the net. Cincinnati tried to hit back from a set piece moments later, but after the delivery from Quinn was sent high above the penalty area as it worked back into the center of the box, de Wit’s effort at a bicycle kick went well over. Cummings also went close to setting up an equalizer with a great whipped ball to the back post that almost found Matt Bahner in the final play of his professional career. FCC’s Eric Stevenson forced a save with seven minutes to go as Neto easily got to a shot toward the right corner, but Valencia ended the game with a late tally as Zaza scored on a breakaway after FCC goalkeeper Dan Williams came up for a stoppage-time corner kick to leave an empty net at the opposite end.